Pope Francis awarded Italian missionary nun at General Audience. 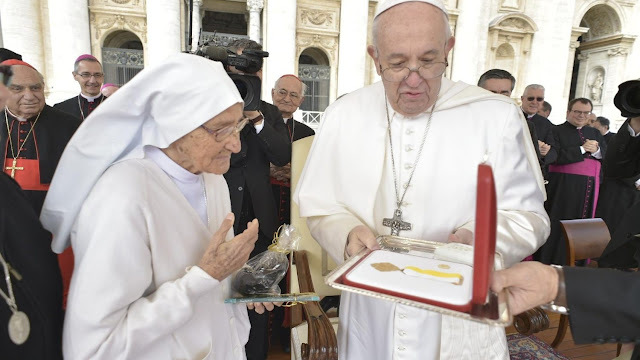 The Holy Father on Wednesday honoured Sr Maria Concetta Esu for her tireless work as a midwife in Africa over the past 60 years. Sister Maria Concetta, who is in Rome for a meeting with her Congregation, is due to return to Africa to continue her work. Bidding her farewell, Pope Francis said, “Let us accompany her with prayer. And may her example help us all to live the Gospel wherever we are."